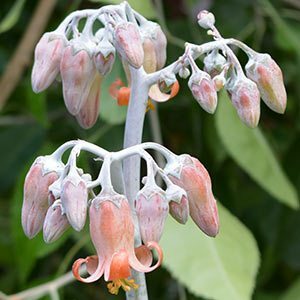 A silvery leafed succulent with attractive apricot yellow flowers, Cotyledon orbiculata is a varied species. This is a very attractive plant in the garden, it is also well suited to growing in containers. 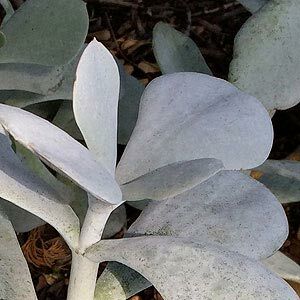 This is a succulent that can easily be grown on a terrace, or in a sunny courtyard or mass planted as a ground cover plant..
Large fleshy leaves are a real attraction, and they are rounded as the latin name suggests. A few named varieties are available including ‘Silver Waves’ although the plant, which is originally from South Africa, is commonly called ‘Pigs Ears’. As this is a low growing succulent it is best suited to growing towards the front of any landscaping scheme. It also grows well in containers and rock hardens. A really good choice for coastal gardens and any dry garden design. The light silvery green of the foliage gives a nice contrast to darker toned plants. This is a species that branches well and will form a nice clump over time. Regular pruning is generally not required although light pruning will help to keep a more compact habit. Width – To .50cm, although can spread further to form a clump over time. Position- Full sun to just a little shade. Not suited to heavy shade. Soil – Well drained soil is essential. Foliage – Silvery green / blue .